Is This New Cheese Ice Cream Any Good?Team Grub gives a new “dessert” from OddFellows and Murray’s Cheese a test drive. A Brand-new Café Specializes in High-Quality Coffee and High-Concept Ice CreamOddFellows’s latest shop opens today in Nolita. The Dish: OddFellows’ Ube-Ice-cream SandwichTheir new ube-ice-cream sandwich with shiso granola and coconut dulce de leche is the result of a single brainstorming session. OddFellows Is Turning Its East Village Shop Into an Ice-Cream-Sandwich EmporiumHow about corn-bread ice cream, cornflake crunch, and blueberry compote, stuffed inside toasted brioche? Where to Eat, Drink, and Celebrate Fourth of July in New York City This YearMaison Premiere, Narcissa, the Dutch, and other restaurants are throwing parties and cooking burgers. Next-Level Egg Creams!Modern egg creams from Odd Fellows, Brooklyn Seltzer Boys, Court Street Grocers, and Baz Bagel & Restaurant. The Cotton-Candy Ice-Cream Cone Is Now a RealityS’mores ice cream plus sugar cone plus smoked cotton-candy. OddFellows Launches Delivery in ManhattanRight in time for the cold weather. Brooklyn Flea’s Ice Cream Fest Will Hit Two Locations With More Than 50Odd Fellows and Morgenstern’s Finest will be there. Brooklyn Brewery’s New Dinner Series; Free Scoops at OddfellowsToday’s Leftovers. Costata Opens For Lunch; Oddfellows Opens East Village LocationToday’s Leftovers. Calexico’s Park Slope Facade; Narcissa’s MenuPlus: Prime Meats’s beer dinner, and more, in today’s Leftovers. Oddfellows’ Gingerbread-Ice-Cream Cake; Graham Elliot Opens His GreenwichPlus: Gorilla Coffee opens on Bergen Street, and more, in today’s Leftovers. Sweater Weather: 17 Fall Desserts You Should Eat ImmediatelyPumpkin puppy chow, parsnip cake, and a beer sundae. Bubby’s MePa Gets an Opening Date; Francis Mallmann Teams Up WithPlus: OddFellows introduces a banana split, and more, in today’s Leftovers. Check Out the All-Star Lineup for Bedford + Bowery’s Hester Street FairThe best of both worlds! 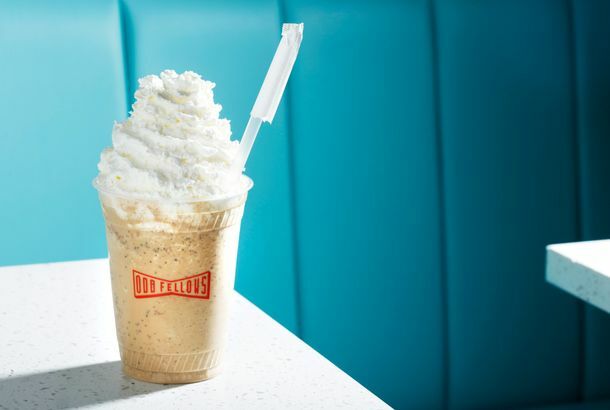 11 Great New Places to Get Ice Cream During the August HeatWith the arrival of some serious new gelaterias, a couple of newfangled retro parlors, and the first local Dairy Queen in three decades, New York is virtually heat-wave-proof. Berries Everywhere: 20 New Desserts to Try Before Summer Is OverStrawberry-tomato sorbet, blueberry pie-shakes, and more. OddFellows Introduces Foie Gras Ice CreamWith peanut butter and cocoa! First Look at OddFellows, Sam Mason’s Williamsburg Ice-Cream ShopOpening tomorrow! 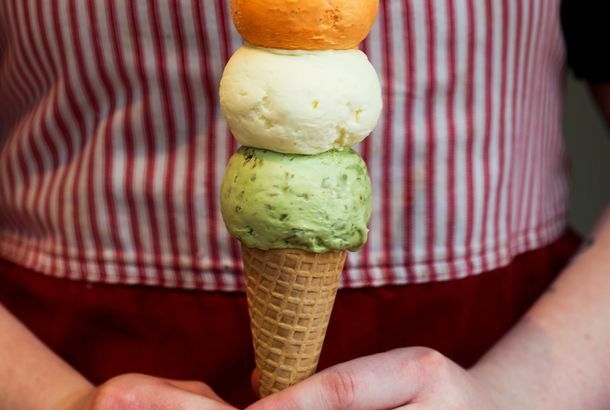 Keep Cool: 22 New York Ice-Cream Spots Debuting Brand-New Flavors for SummerBeet, dirty mint julep, fresh corn, and plenty more.